SOLAR PANEL DRIVEN BEES – I SUPPOSE. They are going to have lots of fun in the first sand storm. Before humans can set foot on the surface of Mars, robots like the Curiosity Rover have been doing an exhaustive reconnaissance job for us. But now NASA has a new idea for sending over more mechanical explorers – and it’s weird, slightly terrifying, and amazing all at once. We’re talking swarms of robot bees. On Mars. These so-called Marsbees – or “flapping wing aerospace architectures” to call them by their technical name – could operate in groups to measure atmospheric conditions or take samples before returning to home base (probably a mobile rover). Now an international team of researchers is investigating the feasibility of the concept. Some of the main checks will take place in a vacuum chamber designed to simulate the air density of Mars, to see whether these dinky flying robots could actually stay aloft. Having robots that are unencumbered by the drag and roughness of the Mars terrain, and which can reach new heights in terms of vantage points, would certainly give scientists more options in taking readings and measurements on the Red Planet. “Our preliminary numerical results suggest that a bumblebee with a cicada wing can generate sufficient lift to hover in the Martian atmosphere,” says one of the team, aerospace engineer Chang-kwon Kang from the University of Alabama. The researchers, including a group from Japan and a group from the US, have just been awarded US$125,000 as part of the NASA Innovative Advanced Concepts initiative (NIAC) to develop their ideas further. In fact, the Japanese team has already developed a hummingbird-like robot that can rise into the air in Earth’s atmosphere. The challenge now is to develop the wing span, movement, and flapping speed to be able to handle the thinner air on Mars. Key to the formula will be inertial power, the idea of maximizing the movement these Marsbees get from a minimal amount of energy. Springs mounted at the base of the wings will help store any wasted energy to keep the bots in the air. A swarm of buzzing miniature drones could be set up in various configurations, says the team behind the idea, and would be resilient too – if one robot failed, the others could carry on. Individual Mars-bees could venture out on their own as well, if needed. 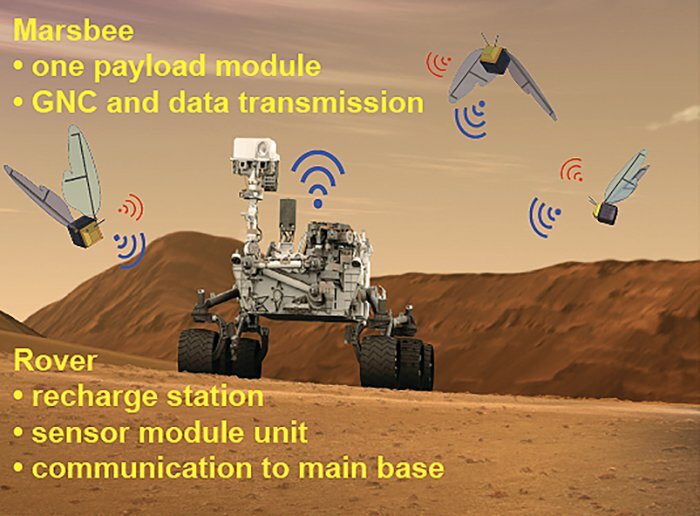 The home base rover would act as a recharging station and a way to beam data back home, according to the preliminary plans, but each Mars-bee would also be fitted with communications gear as well as sensors. This is still a long way from becoming a real option for a future Mars mission though – considerations like take-off and landing, plus what the bots will actually do while they’re in the air, are being left for the second phase of development. But, strange as it may sound, we might one day see armies of robo-bees floating across Mars, checking on gases in the atmosphere and making other observations. Their light weight would make them suitable for loading on rockets headed to the Red Planet. If we’re going to be able to live and thrive on Mars, we need to know as much about conditions on the planet as we possibly can before we set off. Let’s just hope the Marsbees don’t become sentient and colonize the planet before we get there. Other projects approved for development by the NIAC initiative include shapeshifting robots that can adapt their form for land, sea, and air exploration, and a wandering buggy designed to take some of the load off an astronaut’s back. It’s good to see some of the brightest minds in science looking at innovative ways to explore the rest of the Solar System. “The NIAC program gives NASA the opportunity to explore visionary ideas that could transform future NASA missions by creating radically better or entirely new concepts while engaging America’s innovators and entrepreneurs as partners in the journey,” says NASA’s Jim Reuter. Preliminary results for the Mars-bee idea have already been presented at the AIAA Aerospace Sciences Meeting. What I wonder – there were two Robots sent to Mars. 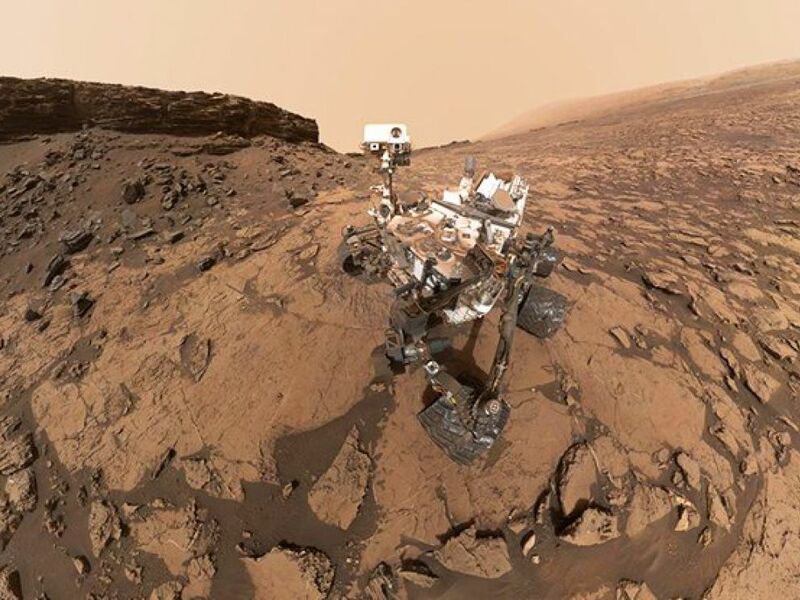 One is no longer working, and is stuck a long way from The Curiosity Rover. It was also not tall enough to take the picture of this one at the top, at the angle this picture is taken. So – what I wonder: Who took this picture ?